How To Relax And Avoid Anxiety Before Bedtime? After a long day at work or with the kids, it’s normal to feel a bit stressed even anxious at the end of the day. You may even feel like there are never enough hours in the day to finish everything on you’re to do list. Thoughts like that can leave a person feeling anxious before bedtime. Trying to go to bed when you feel anxious is hard, you may find that you toss and turn and it takes longer to drift off to sleep than normal or if your day was particularly busy or filled with anxious moments you may not be able to fall asleep at all, with all the thoughts and days events racing through your mind. 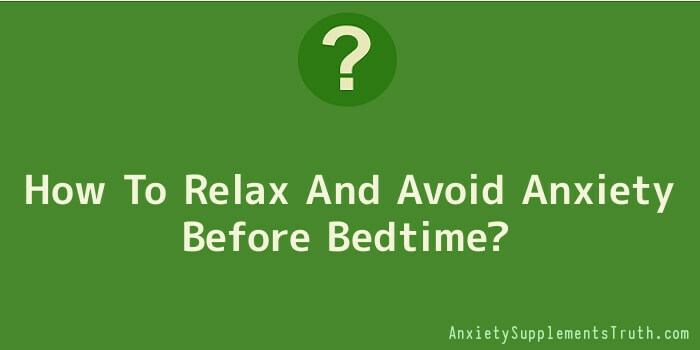 There are many ways you can learn how to relax and avoid anxiety before bedtime. You just have to make time in between putting the dishes away, checking homework and putting the kids to bed to do them. Sleep study experts recommend that you do the following things to readjust your evening schedule and these practices will help you learn how to relax and avoid anxiety before bedtime. If your normal bedtime is 11:00 pm change your schedule or the families schedule so that you have at least one whole hour before bedtime to relax. You can start by changing dinner time to an earlier hour if possible, putting the kids to bed a little earlier and making sure that all the members of the family help out with the evening chores. It is often hard to relax and fall asleep when your mind is thinking about the dishes still sitting in the dishwasher or the missing homework that you will have to find in the morning. Get everything ready for the next day before the evening ends. Get your clothes out, the kid’s clothes out. Have your purse, briefcase, and backpack by the door so you can just grab it and go in the morning. Set the table for breakfast; make your lunch or your families the night before. All of these simple things will be a few less things you have to do in the morning. Learning to do all these things will also allow time for you to learn how to relax and avoid anxiety before bedtime. Experts also recommend you learn how to relax and avoid anxiety before bedtime by learning how to quiet your mind. You can do that by keeping a journal and writing all your day’s events in it or even your thoughts this will allow you to get them out in the open so to speak instead of lying in bed and thinking about them. Taking a nice warm relaxing bubble bath or shower will also help calm your mind. You can sprinkle a little lavender in the bath as well it has a very calming effect. Avoid watching TV or using the computer and put that good book down too. When learning how to relax and avoid anxiety before bedtime you have to learn how to empty your mind and even reading will fill your mind with thoughts of the characters in the book. So, you can sit quietly in a semi-dark room and sip a cup of decaf tea and listen to some relaxing music or just sit quietly.